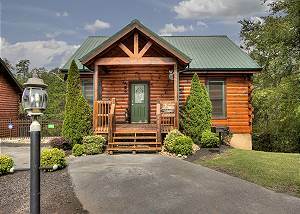 Fantastic 3 bedroom cabin with an awesome location in Pigeon Forge, just minutes from the main parkway in a quiet and peaceful setting for friends... VIEW NOW. Spend a week relaxing amongst the beautiful splendor of the Smoky Mountains at Swimmin With Bears. This stunning 3 bedroom log cabin features an indoor heated swimming pool and a bubbling hot tub on the bottom level, as well as a private deck balcony. Whether you want to splash around in the pool or kick back in the soothing waters of the hot tub, you will love every minute of your time in this awesome cabin. Swimmin With Bears also features a wonderful home theater room where you can experience your favorite movies with a huge screen and state-of-the-art sound. As if this doesn’t sound good enough, this cabin contains a fully equipped kitchen, electric fireplace, pool table, an outdoor firepit, and more than 1 acre of private land! Majestic Waters is another one of our incredible Gatlinburg cabins with both an indoor pool and home theater. This gorgeous 5 bedroom cabin is located just minutes from the entrance to the Great Smoky Mountains National Park, where you can enjoy miles of scenic hikes. After spending a day on the trails, you can look forward to returning to your cabin for a refreshing dip in the private indoor swimming pool. If you prefer to soothe your sore muscles, head just through the double door to the deck with a brand new 5-person hot tub! Wind down in the evening with a night full of entertainment in your private home theater room complete with a projector, movie screen and 12 seats from an actual local theater. The fun doesn’t stop there, as Majestic Waters also contains a thrilling game room with a pool table and action-packed arcade games. With a private heated swimming pool, deluxe game room and home movie theater room, the name of our Splash N’ Play cabin says it all! This 5 bedroom cabin is situated just 10 minutes from the Great Smoky Mountains National Park and has all the amenities you need to enjoy the relaxing ambiance of the Smokies. When you stay at this cabin, be sure to take advantage of the premium hot tub that feels absolutely delightful after strolling through the streets of downtown Gatlinburg. Splash N’ Play also features many other amenities such as a full kitchen, electric fireplace, park-style outdoor grills, a fire pit, and convenient laundry facilities. Check out all of our Smoky Mountain cabin rentals today, including our Gatlinburg cabins with an indoor pool and home theater. We hope to see you soon at Acorn Cabin Rentals!